« Here is a beauitful express of art, but it is not your average creation. 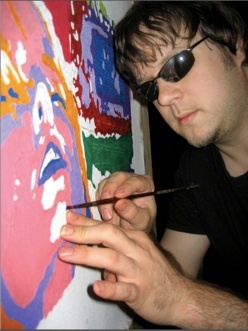 John Bramblitt didn’t start painting until he lost his sight. It was a difficult time. Bramblitt was in his late 20’s and unaware that his sight was seriously degrading until he was sideswiped by an unseen car. He was also worried about having the severe epileptic seizures that had already taken their toll on his vision. And he was angry. In fact, he believes that taking up painting after losing his sight was mostly an act of defiance. While Bramblitt’s twenty-five years of visual experience provided him with mental images of what he wanted to paint, he was uncertain how to render these images on a canvas he couldn’t see. Then he discovered ‘puffy paint’. Puffy paint is typically used for decorating fabric and leaves a thin raised line, a line Bramblitt can touch. Using puffy paint allows Bramblitt to produce an initial outline of his subject on the canvas. He then feels his way across the raised lines with his left hand, as he fills-in the colors using a brush held in his right. For color, Bramblitt uses oil paint, which has proven critical to the process. While oil paint is messier, more pungent, and dries much slower than acrylics, it offers something that no other paint can: idiosyncratic viscosity. According to Bramblitt, “White feels thicker on my fingers, almost like toothpaste, and black feels slicker and thinner. To mix a gray, I’ll try to get the paint to have a feel of medium viscosity”. In fact, he has learned to recognize and mix all the colors he uses by his sense of touch. And the colors are the first thing one notices about Bramblitt’s work (www.Bramblitt.net). While the subjects of his paintings are immediately recognizable, proportioned, and smartly stylized, the colors are supremely vibrant, and nearly psychedelic in their rendering. I found your site to be a refreshing experience, clean and informative… I will be a regular visitor… Many thanks! Thank you, we appreciate your input and hope you’ll continue to visit our site. We love sharing stories about art and people. Thank you for this post, John is an amazing example of the power in personal will and spirit. I will think of him the next time I’m faced with a challenge and know I can take it on no matter how tall. You are absolutely right, we can all grow from the positive input John show us by example. When you love something, nothing can stop you.